Well I’ll be damned. The Cardinals won. 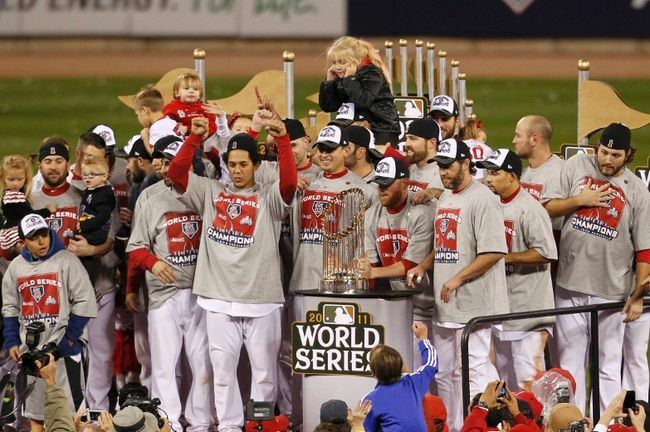 The team that I didn’t pick to win in EVERY series they had (Phillies, Brewers, Rangers) has just won the World Series. This is why I love Sports. The surprise, the intrigue, the suspense and the drama. This World Series had all of that. Heck, this playoff run by the Cardinals had all of that. St. Louis was 10 games out of the Wild Card race in late August. The statistical chances of them just getting into the postseason were 1 in 500. The fact that they were able to overcome such incredible odds to get past the Atlanta Braves, especially having to defeat them in a 1-game playoff on the last day of the season, would have been an amazing story by itself. Then came the Philadelphia Phillies. I picked the Phillies to win the World Series this year. 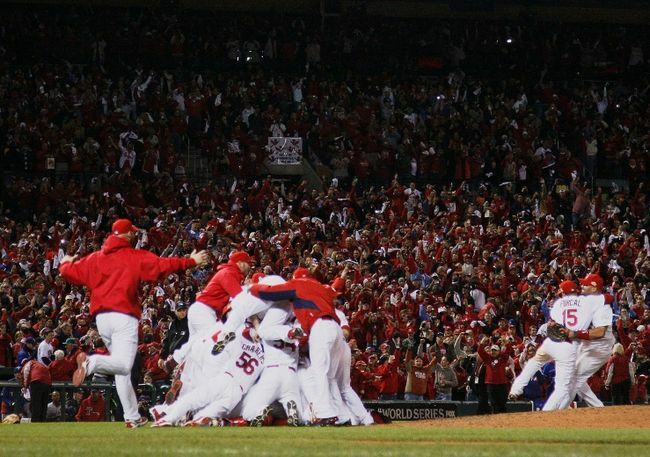 I am smitten for teams that have amazing starting pitching, and the Phillies had that. Roy Halladay, Cliff Lee and Cole Hamels were the most dominant 3 pitcher rotation in the sport, which helped lead the team to the best record in the Majors. They were no problem for the Cardinals. Being able to win close games against amazing pitchers (Their 3 wins were decided by 1 run or less) showed that this team was ready for the big time. I should have known better. The Cardinals were just coming off of a momentum building type of win and comeback over the Braves. The Phillies hadn’t played a meaningful game in months. Like I have written in the past, you can’t discount how important momentum is in sports. The Milwaukee Brewers were next on the chopping list. This is the point where I believed the momentum of the Cardinals would wear off. I thought they would have been drained at this point. A 10 game Wild Card comeback and 5 game opening-round series against the best team in Baseball might do that to you. I was wrong again. The Cardinals scored a total of 43 runs in there 6 game victory over the Brewers. They showed the world that despite all they had been through, that there bats could remain hot and take them to the promise land. The Cardinals dominated the Brewers in their 12-6 series clinching win, holding the Brewers best hitters (Fielder, Braun, Weeks) to just 1-12 hitting on the day. Maybe they were for real. I still had yet to buy into the hype though. Silly me. Last but not least, the World Series. The pinnacle of the sport of Baseball. The St. Louis Cardinals vs the American League Champion Texas Rangers. What did I do? I picked the Texas Rangers in 7 games. In retrospect, it wasn’t a bad pick. The Rangers may have been the most overlooked team in the Majors this year, winning 96 games, as well as knocking off the New York Yankees from the Playoffs in New York City. I was a little skeptical about the match-up for the television audience though. I knew this series would be great action for those who appreciated the game and enjoyed the subtleties of the sport. For those who were just casual fans, it may have unwatchable in their eyes. There were no Yankees, no Red Sox and Phillies. The only true name a casual fan might know would be Albert Pujols. I mean, all the Rangers and Cardinals did was give one of the most compelling, watchable and greatest World Series’ of all time. It also gave us perhaps the greatest comeback of all time. You could make movies out of what the Cardinals did in this series. 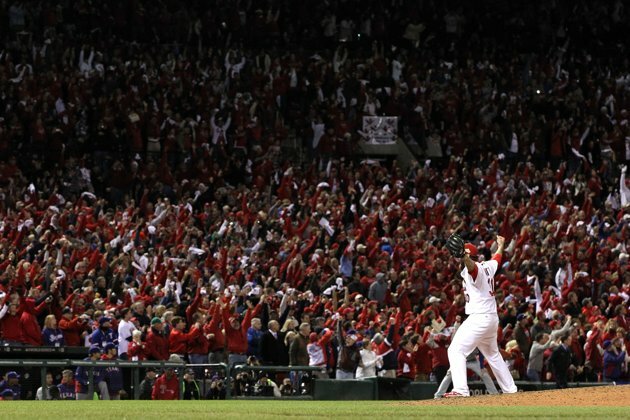 You had one of the most amazing individual performances of all time, with Albert Pujols in game 3. Pujols hit 3….yes 3 Home Runs, helping his team gain a 16-7 victory. Only Reggie Jackson and Babe Ruth have accomplished such a feat. That is some hall-of-fame company Albert is sharing with right now. Perhaps this series will most be remembered for game 6 and the drama that ensued. 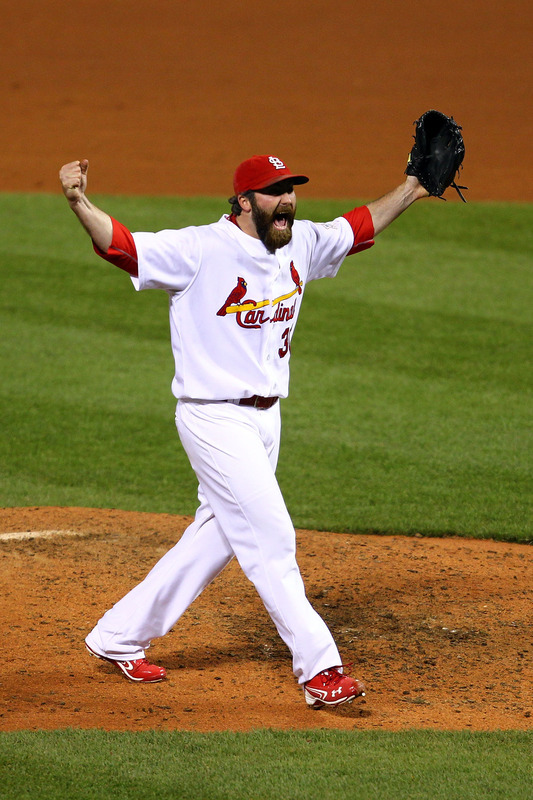 The Cardinals were down to their last strike before elimination….on 2 separate occasions. To watch this game live, and see the Cardinals come back from 9th and 10th inning deficits to win that game was breath-taking to watch. The Texas Rangers will never live that game down. 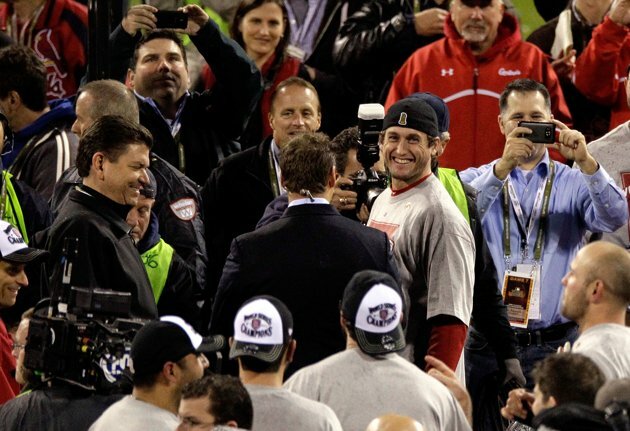 Also, how could you not love the story of Cardinals third-baseman David Freese ? A native of St.Louis who hit the game-tying triple in game 6, the walk-off home run that won game 6, broke an MLB postseason record with 21 RBI’s AND won both the NLCS Championship MVP and the World Series MVP awards? That is quite a playoff resume for a man that may have been forgotten in a line-up featuring Albert Pujols and Lance Berkman. He will not be forgotten anymore, that is for sure. 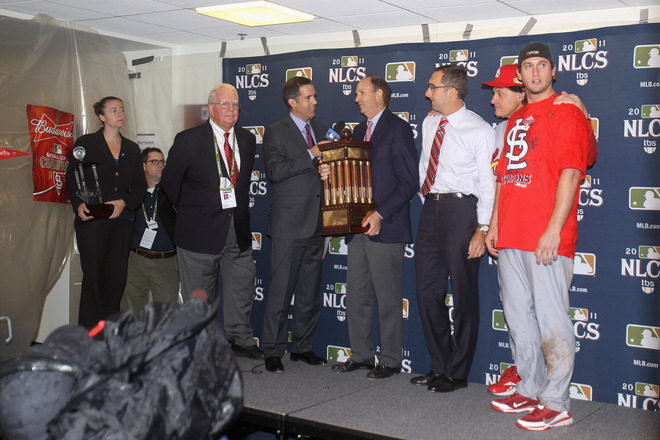 So what is next for the MLB Champion St. Louis Cardinals? Well, I would think the top priority would be to resign Albert Pujols, so he doesn’t end up going to one of the higher-paying markets that the Red Sox and Yankees can offer him. I hope that he does stay in St. Louis because at this point in his career, it would be hard to see him in any other uniform. I mean he just won a World Series with the Cardinals. How much more could you ask for? Believe me, St. Louis would break the payroll to keep him, since he is perhaps the best hitter in the sport right now and the face of that franchise. 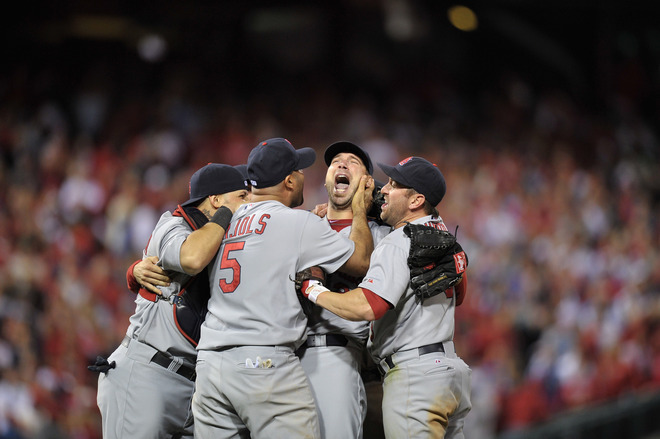 Despite all of that, all that matters right now is that the St.Louis Cardinals are World Champions. 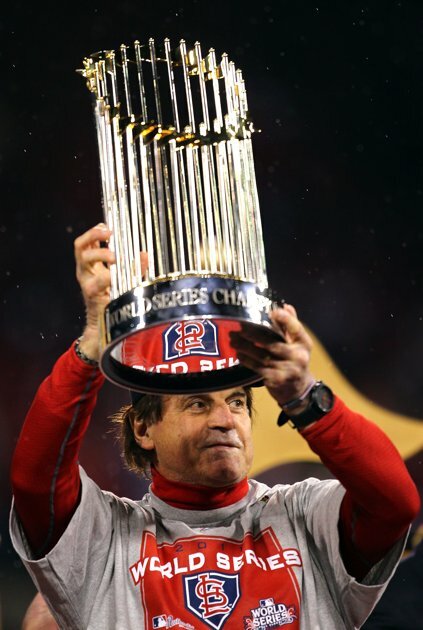 The time is now to enjoy what has been accomplished, and to reflect on one of the greatest postseason runs of all time. I tip my cap to you, Cardinals. Well played.